Super easy dish to put together when you don't have a lot of time but you want to impress anyway! This chicken with oranges and lemons dish is a quick, inexpensive and healthy option. 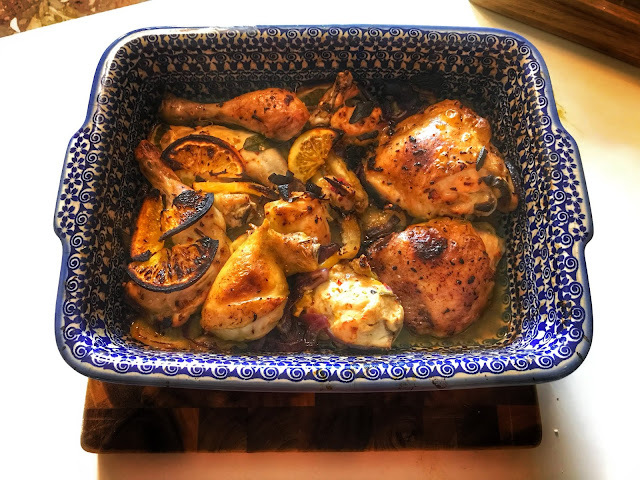 The chicken will turn out citrusy, tender and will melt in your mouth. In a baking dish combine all the ingredients together. Using your hands or a big spoon, mix all the ingredients very well. Place the chicken skin facing up, so you have a tender and moist chicken. Bake in 200C/390F for about 30 minutes or until the chicken is brown. Serve with baked potatoes, rice or anything you like.